When it comes to matters in football, there is a thin brie-cutting wire of a line between blistering indignation and the kind of Radox-soothed indifference usually found in someone, freshly retired, dangling all four limbs over the sides of a shaded hammock. That thin divide can be traversed from negative to positive simply by feeling, however ridiculous something might have been, you have still ended up on top. You might be a 16th century king and your army has just overturned a popular revolt. All of your subjects still think you’re a prick but, hey, you’re the prick with the big shiny crown. Hey-ho. Coming out on top also prevents one from clutching at the anger-straws, shape-shifting through opinions as the situation dictates, adopting a hoity nasal-led posture and extending one’s braces an inch or two out from their usual nippular place of rest. As could conceivably have happened had we lost this game. Why so? 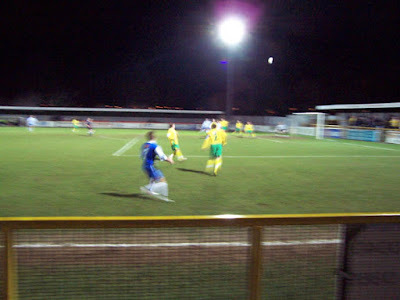 Well, this was after all a game re-arranged not due to a weather-dictated postponing, but due to an abandonment brought about by one set of floodlights making like Michael Barrymore’s career, fizzling out rapidly and unable to make it through a couple of push-starts. Depending who you ask, that first game lasted 19 or 24 minutes, at which point we were leading 1-0 thanks to a fourth minute goal from nippy striker Craig Watkins. Surely there is a case to be made, there having been that occasion where Real Madrid and Real Sociedad came together to play out the last seven minutes of a game disrupted by a bomb scare, that in these circumstances, when the two teams reconvene, only the remainder should be played, with any goals, reds and yellahs carried over. Indeed, had we lost this game, we may well have kicked off on this matter, sending angry emails to the BBC, letters to our MP and a curly turd to Soho Square. You’d like to think we’d have too much rationale to get all foot-stampy and bottom-lip-droopy about an idea as outlandish as that. However we come together as partisan fans, and thus we check in our reasoning when we hand over our entry tenner or, in this case, the raffle tickets we were given after the previous dank and truncated coming together, so as we didn’t have to pay out twice. Luckily, both performances did the job and so there’s no need, necessarily, for any of us to squat over an empty shoebox. 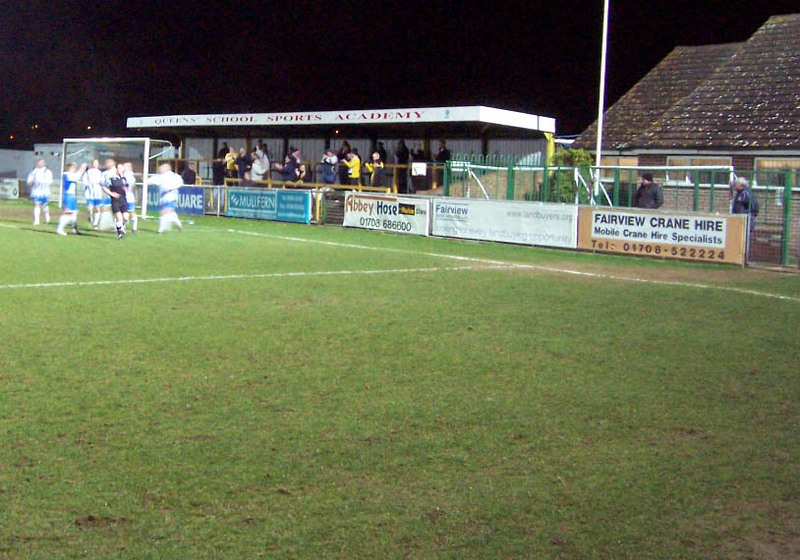 Speaking of makeshift vouchers, you could quite understand Thurrock not bothering with all that and forcing us to pay again, as it’s not as if they’re overrun by punters beating down the turnstiles to take in their games. 158 was the declared attendance for this game, but we were between 40 and 50 in number, and they only just seemed to match us fan-for-fan. They wouldn’t be the first club to embellish their crowds (*cough*Eastleigh*cough*), and I’m sure I once heard that people staying in the Thurrock Hotel, of which the ground is part, were counted as part of the crowd due to an implied complimentary ticket. With it being Tuesday night and the gates so low, it was left to us to create the atmosphere and, in my humble, it was our best league away-day showing for a long while. On the terraces anyway, you couldn’t quite say the same about the on-field performance. That said Thurrock have been in form and we held them at bay, Gary Elphick particularly good at the back, and we did the job all told. Shaun Gale, showing he’s clearly as partial to omens as we are, started the game with Craig Watkins partnering Rocky up front, but unlike the twenty minutes of the abandoned game, Craig wasn’t looking as lively as he can. 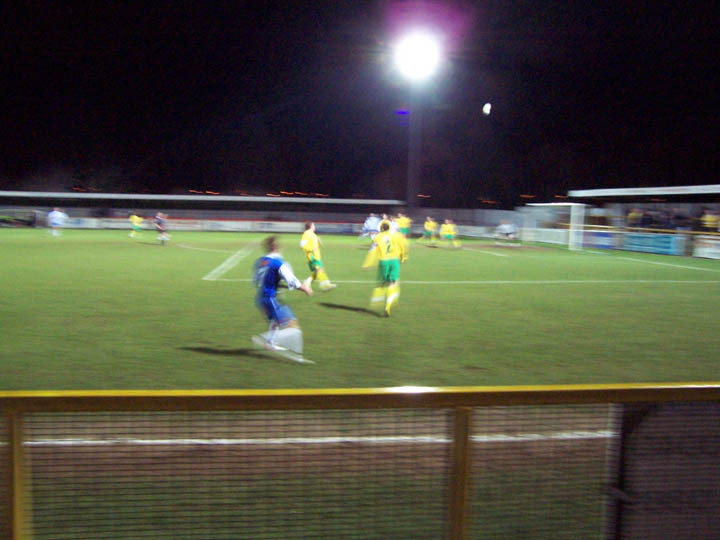 Luckily, Charlie Henry looked as overly pumped up as ever – you’d be hard pressed to find a player so visibly keen – and it was he who provided one of his looping but penetrative crosses on 43 minutes (see above). This set in motion some box bagatelle, which was eventually finished off by Shaun Wilkinson, hammering home a rare goal. A few scares followed both in the remaining moments of the first half and through the second but, finally, come the 83rd minute, we wrapped it up. 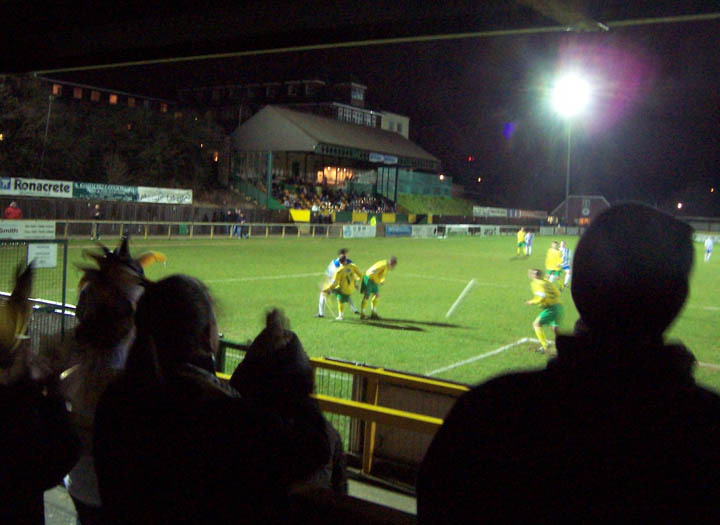 Galey rolled his dice, bringing on our two new faces, Paul Watson (a right-back from Crawley) and Gavin McCallum (a striker brought in from slip-sliding Weymouth – much to their fans apparent chagrin) and this had the desired effect. McCallum looked particularly lively right from his introduction and appears comfortable already working alongside Rocky Baptiste up front. It was their new union that brought about the clincher, McCallum taking the ball to the by-line and dangling over a pinpoint cross that was relatively simple for Rock to head home. The new signings have been made in an attempt to add depth to a squad which, particularly after this win, is finally looking like genuine contenders for storming late into the play-off reckoning. Now in ninth place and only two points from Fisher in fifth, with games in hand on all those above us, save for Newport County, it’s very much in our hands. 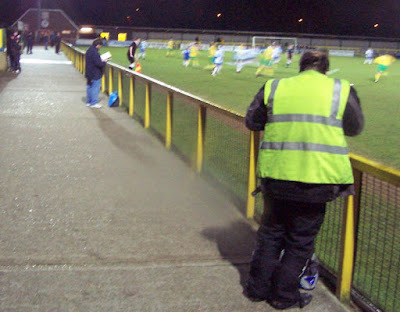 Needless to say this site will be reporting, as last year, from pivotal points in the run-in – crucial away games at Hampton & Richmond Borough, Eastleigh and Bromley as well as one or two home games, depending on how things pan out anyway. Japanther. Dalston Barden’s Boudoir. 07mar08. The art of the wordsmith is noble indeed and generally more entertaining than the games about which you soliloquise. I was amonsgt the travelling Hawks that night but cowering in the stand behind a burger and polystyrene cup. However, I'm sure Rocky half-volleyed in our second, with his right peg rather than is head, as you report. Then again, you were probably closer than me. You know Q, my memory is famously poor and as I wrote this five days after the fact without notes, I am quite prepared to accept that I got it wrong. Mea culpa, I shall be flogging myself raw this afternoon. Serisouly though, I wish more people would correct my factual errors because they are, quite frankly, legion. Cheers Q, thanks for reading and your kind comments.